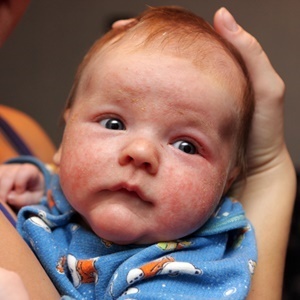 A KwaZulu-Natal girl was diagnosed with a simple rash instead of eczema. Now, the 5-year-old has to deal with rejection from other children because of the scars she has. Five-year-old Shantel* is covered with eczema scars and has lived in isolation almost her life with a condition that could have been prevented if her local clinic had made the correct diagnosis when she was few months old. Instead, the local clinic told Shantel’s mother, Thandiwe Ngubeni, during several visits that her baby had a simple rash and she was give calamine lotion to apply. It was only on her first birthday that Thandiwe found out that the little girl had eczema. Four years later, the little girl is still living with the pain due to the skin condition. Ngubeni, 24, says she first went to Empandleni Clinic at Nkandla in KwaZulu-Natal, then they went to Mondlo Clinic 2 and later also to Thembumusa Clinic. The child was transferred to Vryheid Hospital and then sent to see a dermatologist at Newcastle’s Madadeni Hospital, only to be sent back to Nkandla Hospital. Ngubeni says other parents are often cruel and refuse to let their children play with Shantel because they are afraid that their kids might get her condition. “I honestly believe that her skin condition has prevented her from making friends at home and school because she is afraid of rejection. Kids are constantly tormenting and bullying her for her appearance. What hurt me the most is the people say I infected her with HIV,” said Ngubeni. Ngubeni says that nurses would often shout at Shantel who would cry out in pain when she scratches her itchy body. The desperate mother says she has often mixed ointments she got from the clinic with a traditional medicine called “Isibabuli” which she was told keeps the skin dry and stops it from bleeding. Nurse Fikile Simelane says some patients still take short cuts of mixing their eczema treatment with muti thinking they would heal quickly: “I know and understand that eczema is a painful skin condition but my advice patients with eczema or parents with kids with eczema is to make sure that they follow every instruction from clinic and hospital about who to use the medication they receive; because adherence is very important”. However, for Ngubeni sticking to treatment from the clinic has not always been easy because of frequent medicine stockouts: “I will be forced by the situation to buy it at the pharmacy which is difficult because some of the medication needs a prescription from a doctor. But I don’t have the R300 to see the doctor and maybe another R300 something to buy the medication." According to a study, the skins of atopic dermatitis patients with food allergies show clear markers of a predisposition to allergic diseases and a faulty skin barrier. A study found that people with eczema had a considerably higher risk of suicidal thoughts compared with people without the immunological disease. Nine-year-old Nomonde, from Ermelo, says that because of her eczema children don’t want to play with her - they call her hurtful names, and she no longer wants to go to school. Do you know what fungal infections are? Have you ever suffered from Athlete's Foot? Do you always take precautions to avoid fungal infections? Can you pick up fungal infections in the gym? Can you only get fungal infections underneath your nails?